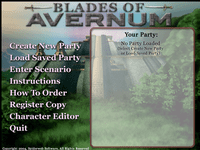 "Blades of Avernum is a non-canon instalment in the Avernum series. Its most notable feature is a free scenario creation kit that can be downloaded and used to make adventures that can be distributed to other players. It has come under fire for being "too complex" in comparison to Blades of Exile, its predecessor, which used a very simple instruction list instead of a C-derivative script system. On the other hand, it has also been praised for allowing many new possibilities using said script system, which couldn't be achieved with the Blades of Exile system. Spiderweb Software has released the source code for the editor and allows others to make enhanced versions and add-ons, which a number of players have done. The most notable adaptation of the editor is a 3D editor, which allows the user to view and edit a project using isometric in-game view." Source: Wikipedia, "Blades_of_Avernum," available under the CC-BY-SA License.